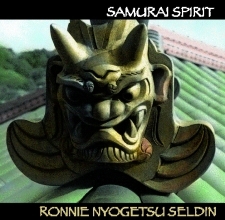 RONNIE NYOGETSU REISHIN SELDIN is founder of the Ki-Sui-An Shakuhachi Dojo in New York City with several branches on the East Coast. 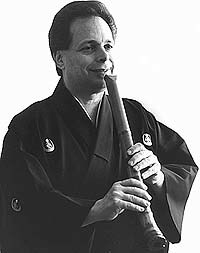 Ronnie studied shakuhachi in Kyoto, Japan with Kurahashi Yodo Sensei, who was a disciple of Jin Nyodo. There, in 1975, he received the name Nyogetsu and a teaching certificate at the level of Jun Shi-han in the Kinko school of shakuhachi. After his return to New York, Nyogetsu was awarded the rank of Shi-han (Master) in 1978, as a result of his efforts to spread the teaching of this instrument in America. In 1980, he received his Dai Shi-han, or Grand Master's license. In 2001 he received Koku-An Dai-Shihan (Grand Master's license at the level of Kyu-Dan, or 9th level) from Japan's Living National Treasure in shakuhachi, Aoki Reibo. Ronnie was also given the name Reishin (Heart/Mind of the Bell) at that time. Eight Kinko honkyoku played in the Jin Nyodo-style. This CD includes the entire Nezasa-ha repertory. Nezasa-ha pieces are rarely performed and unusual in that they utilize an unusual panting breath technique known as "komibuki." 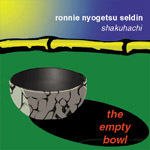 Also includes a bonus track: a new original composition by Nyogetsu. Original compositions, healing honkyoku &"neo-honkyoku". Shakuhachi and cello, solo's & duets, traditional and modern. Shakuhachi honkyoku and original compositions. This CD is an offering by the licensed teachers of the KiSuiAn Shakuhachi Dojo. Founded in 1975 by Ronnie Nyogetsu Seldin, the dojo is the largest school for Japanese bamboo flute in the western world. The traditional pieces here were passed down through the ages to heal and provide for safe passage for the spirit. 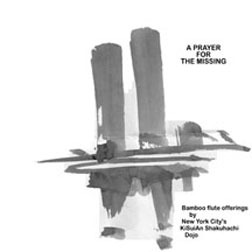 All profits from the sale of this CD will be donated to New York City ­ based relief organizations responding to the 9-11-01 disaster and its repercussions.